...... All the rest All-in-1 Mobile Video Converter will do for you. All-in-1 Mobile Video Converter will choose proper codec and most optimal encoding parameters (resolution, bit rate, frame rate, etc). Of course you can set these parameters by yourself if you want. The number of supported video formats is really amazing. Here are some (avi, 3gp, wmv, mpg, mov, vob, fla etc). Bet you won't find a video file for your mobile device that All-in-1 Mobile Video Converter can't handle. Simple and vibrant interface won't require reading boring documentation. 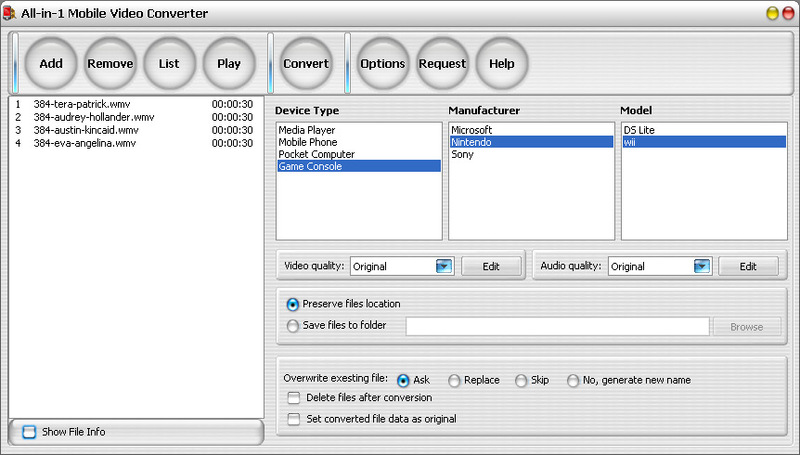 With All-in-1 Mobile Video Converter video files conversion is as simple as 1,2,3. Qweas is providing links to All-in-1 Mobile Video Converter 4.10.06.27 as a courtesy, and makes no representations regarding All-in-1 Mobile Video Converter or any other applications or any information related thereto. Any questions, complaints or claims regarding this application All-in-1 Mobile Video Converter 4.10.06.27 must be directed to the appropriate software vendor. You may click the publisher link of All-in-1 Mobile Video Converter on the top of this page to get more details about the vendor.